SITTWE, Burma The death toll from recent ethnic violence in Burma's western state of Rakhine has surpassed 100, an official said Friday, as the government warned that the strife risks harming the country's reputation as it seeks to install democratic rule. Rakhine state spokesman Win Myaing said 112 people had been killed in six townships in clashes that began Sunday between members of the Buddhist Rakhine and the Muslim Rohingya communities. He said 72 people were reported injured, including 10 children. The government of Burma, which is also known as Myanmar, announced earlier that almost 2,000 homes had been burned down in the conflict. A resident of another township, Ramree, said there also was violence there Friday morning. "There were some clashes between the two sides in Ramree this morning," Kyaw Win, 30, said by phone. "Residents are very fearful of imminent attacks by the Muslim community because security presence is very little. We don't feel safe. We want the Bengalis to be moved away from the Rakhine community," Kyaw Win said. Rakhine prefer to use the term Bengali for Rohingya, whom they contend are not a distinct ethnic group. Thein Sein took office as an elected president last year, and has instituted economic and political liberalization after almost half a century of repressive military rule. "The army, police and authorities in cooperation with local people will try to restore peace and stability and will take legal action against any individual or organization that is trying to instigate the unrest," the statement warned. The long-brewing conflict is rooted in a dispute over the Muslim residents' origin. Although many Rohingya have lived in Burma for generations, they are widely denigrated as intruders who came from neighboring Bangladesh to steal scarce land. The U.N. estimates their population in Burma at 800,000. But the government does not count them as one of the country's 135 ethnic groups, and so  like neighboring Bangladesh  denies them citizenship. Human rights groups say racism also plays a role: Many Rohingya, who speak a Bengali dialect and resemble Muslim Bangladeshis, have darker skin and are heavily discriminated against. A statement issued late Thursday by the office of U.N. Secretary General Ban Ki-moon described the latest violence as "deeply troubling." Ban called on Burmese authorities "to take urgent and effective action to bring under control all cases of lawlessness." "The vigilante attacks, targeted threats and extremist rhetoric must be stopped," Ban said. "If this is not done, the fabric of social order could be irreparably damaged and the reform and opening up process being currently pursued by the government is likely to be jeopardized." In a hospital in Sittwe, the state capital not yet hit by the latest round of violence, an Associated Press photographer talked to four wounded people brought in from the affected areas. 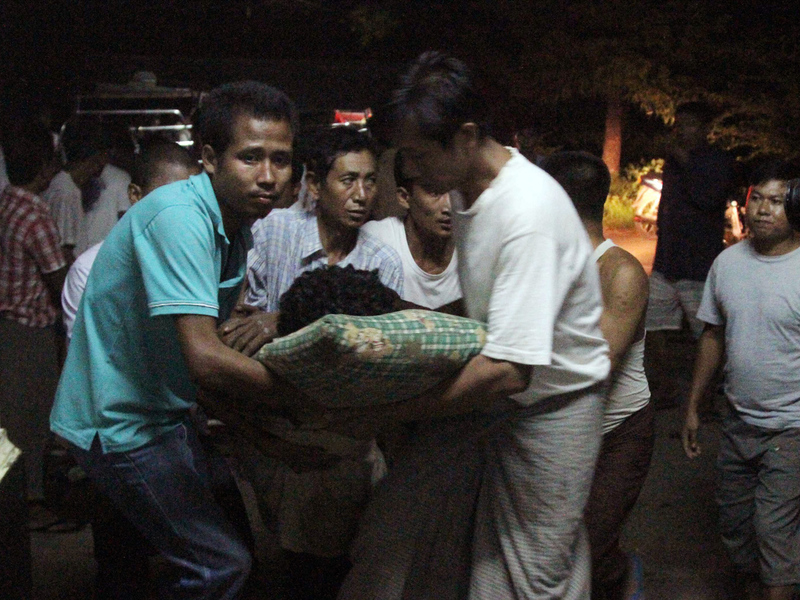 Aung Moe Khaing, 25, was wounded in an arm and a leg, saying he was shot Tuesday when soldiers dispersed the crowd. There have been concerns in the past that soldiers were failing to protect the Rohingya community, but accounts this time from Rakhine villagers suggest that Burma's military may have been defending the Rohingya. On Thursday, Bangladesh border guards turned away 45 Rohingya trying to enter into Bangladesh by boats, said Lt. Col. Khalequzzaman, a border commander. Local police chief Selim Mohammad Jahangir said Friday that at least another 3,000 Rohingya Muslims had been spotted on about 40 boats on the Naaf River off Bangladesh's Tekhnaf coast. He said the boats may try to enter Bangladesh, but "we have instructions not to let them come here." Bangladesh says it's too poor to accept more refugees and feed them. Bangladesh is hosting about 30,000 Rohingya who fled Burma to escape government atrocities in 1991.